They say that good anglers are not patient. That they are always thinking of how to get that next bite or to find a way to turn a blank into a successful session. On days when nothing you do seems to make a difference it can be a good idea to reign in your impatience, make a decision and stick with it. I find that in low water temperatures you can be better waiting for the barbel to find your bait than trying to attract them by a regular trickle of feed. 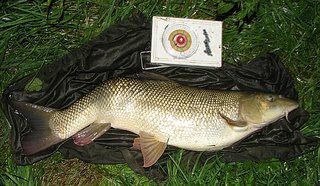 There are those who say you should cut back on feed in winter to avoid overfeeding the barbel, but I'm not sure that's how it works. I have a feeling that they are capable of seeking out the bait just as easily as they can in warmer water, but don't rush to get to it when the water is cold. So why plonk a little pile of feed out and move your bait away from it before a fish has found it? Casting a bait out with a small amount of feed around it and leaving it there for as long as possible (at least an hour), provided it's been cast to a spot that is likely to produce a take, has produced a fair few decent fish for me during the winter. 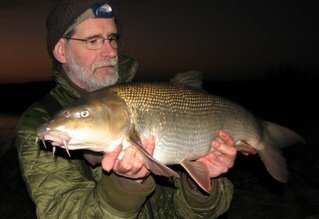 Having set off from home at four in the morning to start fishing at seven in constant rain and a strong wind, the Trent looked good. Three foot or more up, nicely coloured and warm enough at 7.5c - actually rising to 7.6c as the day wore on with the air temperature over 12c at dawn. Not much happened, nothing in fact, despite the usual trick of casting baits around the swim to try and locate a fish or two. I was fishing a swim I had taken an eight pounder from on the first cast a couple of weeks earlier. So one bait was repeatedly recast to the productive spot - even though it was the only barbel I caught that day. As the rain stopped and the wind dropped late in the morning conditions seemed better, and by mid-afternoon were looking really good. Dusk had to produce a fish or two. Having snagged a rig up while having twenty minutes in a different swim I'd retackled with a double boilie rig, wrapping some paste between the two baits. To this I added a small bag of halibut pellets. This was cast to the previously productive spot, on the edge of the flow on the outside of an eddy. The other rod was still being rebaited and recast to different spots, but that one was in the right place and was going to stay there until debris or a fish shifted it - or I admitted defeat and packed up! Nige was fishing the next peg upstream and at four o'clock as the light began to fade his 21mm pellet was taken by a fish around seven or eight pounds. Twenty five minutes or so later my double boilie rod was away. The fish didn't feel particularly big, but fought well enough when close in. It wasn't until we got a sight of the width of its back and depth of its belly that we realised the scales and camera would be required. One take that results in a fish like that makes the early start and long drive well worth while. But if I'd kept fidgeting with the baits, it might never have happened. I've taken the decision to approach my piking like I do the fishing I do for other species. To concentrate on fishing waters that are capable of producing big fish, rather than just going fishing for the sake of it. In the past I have been quite happy to go piking anywhere, and to enjoy learning about new waters and trying methods. I'm not saying that I have all the answers, but I have come to understand that it is better to do a few things well than do a lot of things okay. I've not been piking since February, and last winter I only went a handful of times. 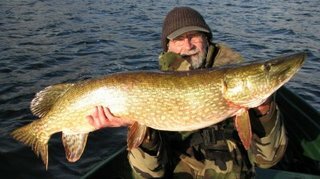 Last winter I decided that I would only pike fish on Blithfield. It fished poorly, but I managed to catch a few jacks and two doubles, well two twenties actually... That seemed like a decent result for a season, and I went back to chasing barbel! This winter I had a day booked on Rutland, but had to cancel, and got lucky in the PAC draw for Menteith, getting a boat for the lure day. Despite a bad forecast that proved fairly accurate, with strong winds and very strong gusts in the rain squalls, it fished well. There were plenty of pike to be caught although a lot were small fish. 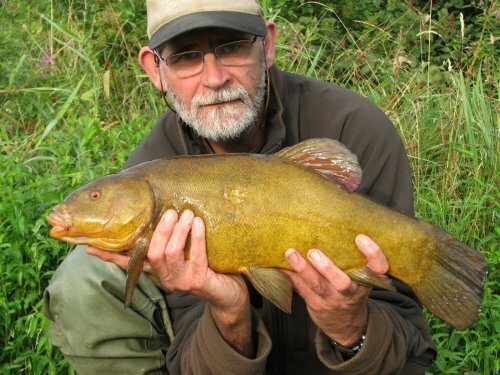 My mate Nige Grassby and I were catching jacks from the off. Nige had a well built fish of about 13lb, really solid, and another scraper double among his jacks. The takes, all on the troll, were all the same. A few initial thumps from the fish followed by it going dead giving no indication of their size until it popped into view and then wagged its tail as it neared the boat. You couldn't tell if the fish was three pounds or a double. The take I got around two o'clock was just the same. But it carried on being a dead weight as it cruised past the boat. "I don't think it's all that big" I said, as I turned it very easily. Then it came up in the water and looked like a low twenty as it dived under the boat stripping line off the reel. Next time it came up it grew a bit as it headed towards the net. Obviously a 25 plusser it pulled the scales down to 29lb! On the next trolling pass Nige got a take that did the usual trick of a few early head sakes then going solid. Where there's one big fish there's usually another. "I don't know what I've got on here" he said, as he pumped it back to the boat. "It could be a big branch." I have an idea we were both really expecting another lump to hove into sight. What actually broke surface was a pike about four pounds! 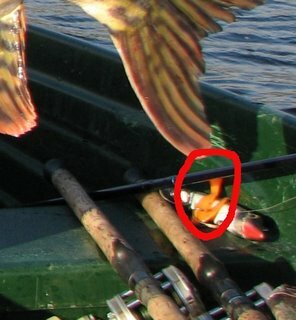 After unhooking the twenty-nine I found the tail had come out of the Burt and put it carefully to one side (below). No worries, I had some superglue in my spares box. Only one problem - the glue had gone solid. I shoved the tail in the Burt and tried wrapping some insulation tape around it to hold it in place. It worked for a while, but the tape came unstuck and was affecting the lure's action. Despite trying a couple of other Burts I didn't manage to get another take. Mind you, Nige only got one more jack before it got rough again and we ran for home - quarter of an hour before the scheduled finishing time instead of our usual quarter of an hour after. A funny session on the Trent. River up a foot or two maybe, but fairly clear. Overcast and raining but mild despite the wind coming from the north. A late start around four pm and the first fish was a chub of four pounds that I found hanging on the end of the line when I wound in! Chub knocks were the only signs until a 'bream bite' signalled the arrival of an eel of about a pound. The next 'bream bite' resulted in hooking a very odd feeling fish. Bream? Maybe, until it popped up on the top and in the light of the head torch looked a bit wriggly, then it took some line and splashed on the surface making me think it could have been a chub. 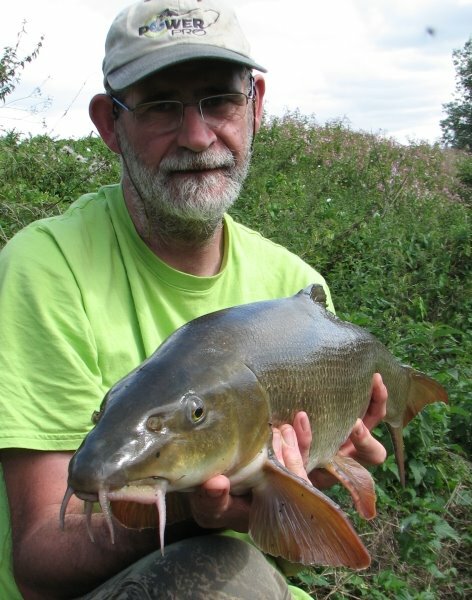 So I was surprised when the head of a barbel came over the net, but what a strange looking fish! In apparently well fed condition, and apart from its deformity healthy looking. It weighed seven and a half pounds. On release it's peculiar swimming action made it obvious why it felt so weird when I was playing it. After that a 'barbel bite' resulted in a fish dropping off and a missing boilie, and the next cast produced a 'bream bite' and a bream. Another 'barbel bite' was connected with briefly, but this time a chewed boilie came back. Hmmm. I moved one bait downstream of where the bites had been coming from and within five minutes yet another 'barbel bite' was had. This time the fish stayed hooked - and turned out to be another four pound chub. At which point I called it a night. I don't know why Trent chub behave like this when Ribble chub are more traditional in their refusal to give 'propper' bites when using hair rigged baits. And Trent chub seem to make a better effort at fighting back than their Lancastrian cousins. I've had a couple of sessions on the Trent since the last entry. A few barbel-less hours on a Sunday evening, and a full day on a stretch I hadn't fished before. The second session resulted in one small fish landed and one good one lost to a 'hook pull'. One of those inexplicable cases of a fish having been on for a while and almost ready for the net when it just came adrift! How do they do that? The method was the good old mesh bag of pellets with a boilie on the hair. A week later I headed back for a longer session, albeit with a delayed start. Setting up around three in the afternoon I was on the feeder with hemp and groats bound together with a new groundbait I had been sent to try out. The river was up a couple of foot or so, and rising slowly with a nice touch of colour. Despite the sunshine I was confident. A few chub rattles were had, when eventually one managed to hang itself on the down stream rod. At five pounds seven ounces it was worth having - although chub never look 'big' in photos). This fish came around an hour before dark and it was about three hours later that a small barbel picked up the upstream bait, two boilies on the hair. Another, but smaller, chub came along around nine forty,and shortly after that I decided to get my head down for the night. It was still mild as I turned in, but with fog forecast for the morning. Friday the thirteenth dawned to the forecast pea souper which made the short drive to another stretch difficult with a windscreen that refused to demist - I missed the turning to the water at the first attempt and almost overshot it at the second attempt! Getting there early gave me a good choice of pegs and I got the one I fancied. The approach was the same feeder based one as the day before. With the level up it wasn't possible to fish as far out as I would have liked, even with five or six ounces the weed build up on the line made keeping a bait in place for long difficult. The fog was slow to lift, only clearing around midday but by then I had landed four barbel in the five to six pound range - all coming to the downstream rod. 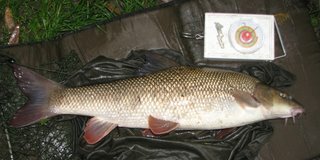 After a flurry of three fish in half an hour I was thinking along the lines of Friday 13th, fishing peg 13 and catching thirteen barbel to thirteen pounds. But four was to be the limit. I fished into dark without a bite until a chub of around three pounds committed suicide as I was packing up. Another trip to the Avon on the 14th, the drive south being made in rainfall of ever increasing intensity. Unsurprisingly the river was up a good six inches, and rising. Fishable at first but when the rain stopped around noon the amount of weed coming down made fishing the two swims I had been shown all but impossible. I'm sure fish were still there, but keeping a bait in place long enough to tempt them was the problem. As the rain fell during the morning one barbel of 8lb 4oz had succumbed to my boilie, fished in conjunction with a four half-bait stringer. The method being to leave the rig out for as long as it took. 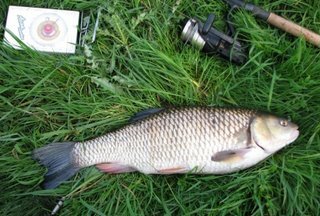 A chub an ounce under four pounds fell for the same tactic - this time with a small bag of pellets in place of the stringer. But the afternoon saw baits remaining in place for about fifteen minutes, rather than the hour or more that had resulted in fish. What to do? By mid-afternoon it was too late to head for the Trent as I'd hit the rush hour traffic on the M5/M6. Not worth sticking it out where I was as it would be a brick wall job. So rods wound in and off for a wander downstream. I was looking for somewhere I could present a bait in the flow, but where the line wouldn't collect debris too easily. I soon found it behind a fallen willow. With the level up there was water coming through between the bank and the willow, a slack behind it and the main current pushing round the outside of the bend beyond. It was a bit of a cramped spot with the level as it was, and the overhanging trees made casting difficult, but a move was made. In went a few droppers of pellets on the outside crease and two baits (with attendant bags of pellets) went out. One at the top of the crease and one further downstream where the slack tailed off. After only fifteen minutes another eight pounder was landed, this one two ounces heavier, on the downstream rod, followed by a six pounder an hour later. Far more satisfying to use my brain to catch those two fish than had I caught them from a swim I had been shown. 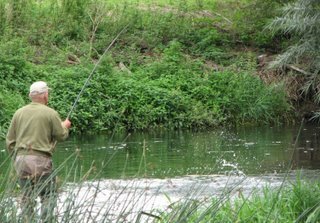 The river continued to rise slowly yet remained fishable, but shortly before nine pm a smallish bream decided me to get some shut eye and plan the following day's campaign. Up at five thirty and a walk to the river showed it had risen a good six inches more. The willow swim was almost cut off and the eddy more of a swirling cauldron than the calm haven it had been. It could have been fished but would have been a struggle. A walk along the whole stretch found no more likely looking spots. Well, there was one, but there was no way a fish could have been landed from it, so it was out of the question. The original swim was inaccessible, but the next one down, from which a bait could be placed in the same spot as from the upstream swim looked okay. Just so long as there wasn't much rubbish coming down. I decided that I might as well have my bacon butty on the river bank as in the car park, so I put a couple of rods out. This soon proved that the weed hadn't abated, and from placing my landing net in the water it was obvious the river was still coming up. After a couple of hours I'd had enough, tackled down and headed home. Having been invited down to the Midlands for a spot of zander fishing by John Cahill I also got the chance of a day with Mick Bowen on the Avon and one on the Wye with Steve Bown after barbel as the zander fishing would be a nocturnal affair. The first night's zedding was a flurry of activity, but a lot of dropped runs and only small fish landed. I lost one and landed one. Nothing above four pounds. So off to the Avon with Mick in the morning. After a few hours Mick went trundling pellets round a bend and was soon into a fish of about five or six pounds. Not long after I was into my first Avon barbel. Far from a monster, but a fish from a new-to-me river nonetheless. Another fish, a little bigger came along before it was time to pack up and head back to the zedding for the evening. 10mm halibut pellets fished over loose fed 6mm and 10mm pellets with a bag of the same on the hooks did the trick. The night was quiet apart from Steve Bown getting a zander about six pounds early on and me losing an eel in the three pound range when a treble got stuck in the landing net. A late breakfast was had in the morning before heading off to the Wye with Steve. 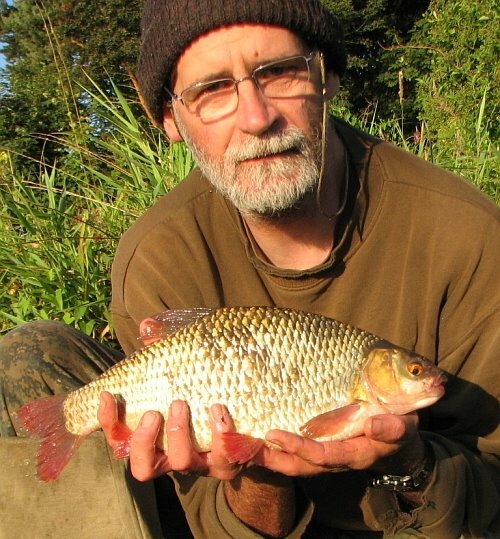 It wasn't long before he had the first barbel of the day, one of around four or five pounds. Things went quiet and a move was called for. In went some feed and as soon as some cloud cover rolled in, right on cue, Steve hooked and lost a fish. This set the pattern and every time some cloud came over, it was a bright and hot day, the rod tops would start rattling. Mine was the next to lurch over and we were soon guestimating the weight of the fish in the net. 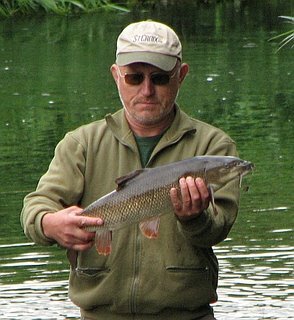 The scales decided the argument by settling at 8lb 14oz - not bad for a first Wye barbel. I hooked and lost two more fish before landing a six pounder that turned out to be the last fish of the day. 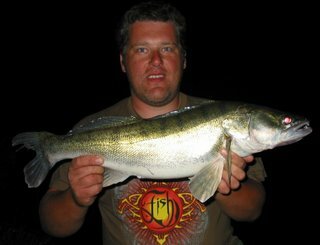 The final night's zander fishing kicked off well for Steve with a seven pounder, but the rest of the night was quiet in the extreme - which was good for me as I was lacking sleep! Breakfast at six and on the road home by seven fifteen along a strangely quiet motorway system! Thanks to all concerned for the hospitality. Having caught my fifth tench of the season from water X on April 25th, my second visit, I got my sixth on the 11th of August. A battle scarred fish of 6lb 5oz. I was itching to try out my new camera so took some pics of myself holding a hybrid this session. Not the largest I'd had, but still a boilie munching three pounder.